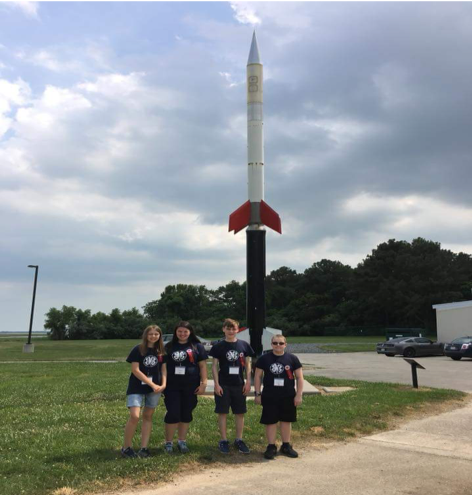 Eight youth from Granby 4-H along with one leader, Rachael Manzer successfully launched three experiments into space on a NASA rocket. 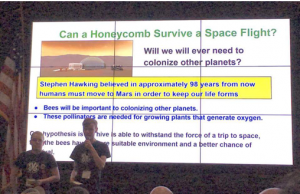 The three experiments included “Bees in Space” where honeycombs were launched, “Rubber Bands in Space”, and “Gallium in Space”, all of which were proposed by the 4-Hers themselves. Cubes in SpaceTM, a global competition designed to help students ages 11-18 launch experiments into space on a NASA rocket at no cost made this opportunity possible. It took the 4-Hers approximately four months to write their experimental proposals based on their interest, long hours of research, and thinking. These proposals were then submitted electronically to Cubes in SpaceTMwhere experts reviewed all applications. After making it through the first round, 4-Hers answered questions, revised their proposals, and resubmitted them for a second review. After months of waiting, final decisions were made. All three Granby 4-H proposals were selected as part of the 80 experiments selected out of the 450 total proposals submitted. The “Bees in Space” experiment studied if honeycomb changes shape during flight. Club members took pieces of honeycomb from the club bee hive to design the experiment. The “Rubber Bands in Space” group evaluated how rubber bands are affected by a microgravity environment by creating a rubber band ball. By placing a solid piece of Gallium in the cube with padding the “Gallium in Space” group studied if Gallium changes into a liquid state during space flight. All participants of the 80 selected experiments were invited for the launch at NASA Wallops Center where they presented their experiments to an audience of 300 people. Members gained valuable experiences through participating in the Cubes in SpaceTMproject. 4-Hers learned the importance of working together, how 4-H and STEM fit together, and learned the process of doing research. Members note that the experience provided them with the opportunity to practice problem solving skills, answer their own questions, embrace their curiosity, and have experience in the world of STEM. UConn 4-H is the youth development program of UConn Extension in the College of Agriculture, Health and Natural Resources. 4-H is a community of over 6 million young people across America who are learning Science, Technology, Engineering and Math (STEM), leadership, citizenship and life skills through their 4-H project work. 4-H provides youth with the opportunity to develop lifelong skills including citizenship and healthy living. To find a 4-H club near you visit 4h.uconn.edu or call 860-486-4127. This entry was posted in 4-H Youth, Education and tagged 4-H, Cubes in Space, Granby, NASA, STEM.